APPEARANCE: Hakuzōsu is the name of a monk, as well as the kitsune who transformed into the priest and stole his identity. The story has been adapted many times over the centuries, with the names, places, and other details changing across different adaptations. Ehon hyaku monogatari places the story in Yamanashi Prefecture, at the base of Mount Atago. The kyōgen theater piece Tsurigitsune is based on a 14th century version of this story from Shōrinji, a temple in Sakai, Osaka. LEGENDS: Long ago lived a trapper named Yasaku. He made his living by trapping foxes and selling their pelts in the market. An old, silver furred kitsune lived in the mountains where Yasaku worked. He had lost his friends and family members, one by one, to Yasaku’s traps until only he remained. He decided he would teach the trapper a lesson. 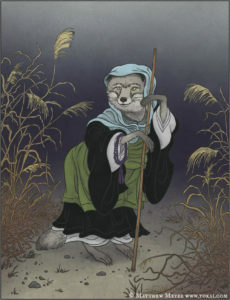 The kitsune knew that Yasaku’s uncle was a monk named Hakuzōsu. The kitsune disguised himself as Hakuzōsu and paid Yasaku a visit. He scolded him for hunting foxes, preaching the Buddhist precept that killing any living being is a grave sin. He referenced the story of Tamamo no Mae, whose sins caused her to be transformed into a boulder as a punishment. He even gave Yasaku some money in exchange for the rest of his snares. Finally Yasaku promised to stop killing foxes. Pleased with his success, the kitsune skipped back into the forest. However, the money was not enough to support Yasaku’s lifestyle. He quickly spent all that the kitsune had given him. He decided to travel to his uncle’s temple to ask for more money. The old kitsune discovered Yasaku’s plan, and realized that his deception would be discovered. He went to the temple ahead of Yasaku and located Hakuzōsu. 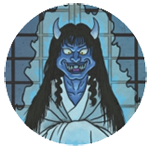 He lured Hakuzōsu away from the safety of the temple and devoured him. The kitsune once again disguised himself as the old monk. When Yasaku arrived to ask for money, the kitsune disguised as Hakuzōsu scolded him and sent him away empty handed. For the next fifty years, the kitsune lived at the temple, disguised as Hakuzōsu, and faithfully performed the old monk’s duties. One day, a deer hunt took place at a nearby farm. Many people traveled to the farm to witness the hunt. Hakuzōsu (the kitsune) went to spectate as well. At the farm, two dogs belonging to a samurai sensed the kitsune’s true identity. The leaped upon Hakuzōsu and ripped him to pieces. When the dogs were finally called off of the old monk, the torn body of an old, silver-furred kitsune was discovered and Hakuzōsu’s true form was exposed. The villagers, fearing that the kitsune’s spirit would return and curse them, buried the body in the shade of a nearby mountain, and erected a small shrine over it.